Topic: Is it a VERMONTER thing? Just curious about some things I have run into around the "Tourist Area" of Vermont where I live and was wondering if you all have similar experiences. and have received not ONE call back. Seems if you offer to give people around here $, they want you to chase them down. Re: Is it a VERMONTER thing? Sounds like contractors have the upper-hand in your area. High-demand, low competition. It's definitely not like that here in North Texas. There is high demand, but because of the size of the population there is no shortage of competition. We got a new roof recently, and the time-frame from meeting with the contractor we chose to completion of the roof and fence re-staining was two weeks. The trade-off is that you get to live in Vermont while we're stuck here in North Texas. It is fall and they have their coffers filled with work so they are busy and do not have the motivation to add to the work pile. In winter they would want that work, but there will be no weather possible to fill that desire if a typical winter. So, they are cramming everything they committed to now and there is not enough workers to take on additional work or they would be calling you back. That is my guess. Sounds like a good guess. We had a very hot summer that didn't allow longer days only because we thought we were lucky enough to survive an 8 hour day in the heat. The extra hours that weren't used just means that you're time that will need to be made up later, schedules get set back, customers ask for extras and before you know it now you're a month behind. When the cooler weather comes it's balls to the walls and all you want to do is get it done and keep everyone happy before the snow season and then holidays are upon us, and everyone wants it done before that. Everyone should be calling back once the snow falls, small inside work will be welcome then.Best bet is to catch someone with an opening just after New Years. That's usually a slower time for contractors that haven't stacked up winter work. March is also a good time to get the ball rolling ....everyone has had a break from the holidays and are ready to be serious before tax season. I'm in upstate NY , that's pretty much how it works here too. All same in central Ontario and of course we were just notified that there was a possibility of snow so every one will be panicking, I've got a roof repair, small one, nothing serious, and 5 years ago could have done it in about an hour and a half but now my oxygen tube won't stretch that far and with out the O2 I'd probably go to sleep half way through, #$%*, #$%*, #$%*. Golden Years I'd love to have the SOB that coined that, in front of me so I could piss on his foot. We always got slow around the start of school, the holidays and tax time. Well the snow started falling yesterday, so the porch project will have to wait until next year. The wife wants the new bathroom done before Christmas so looks like I will have to do it myself. The carpentry, plumbing and electrical work is not a problem, but putting in tiles on the floor & walls should be a challenge. I've very little experience w/ that part of it. Putting in 8 foot long glass wall w/ a glass door for the shower should be a challenge and now the wife also wants a sunken tub......the plans keep changing and the price keeps going up. But doing it myself I figure the $ I save not paying a contractor should balance out. I would like to ask a question that’s off subject. I come every year to Americade, and would like to know if you could recommend an area for antiques. I like to incorporate rides with looking for old oil lanterns, which I restore. 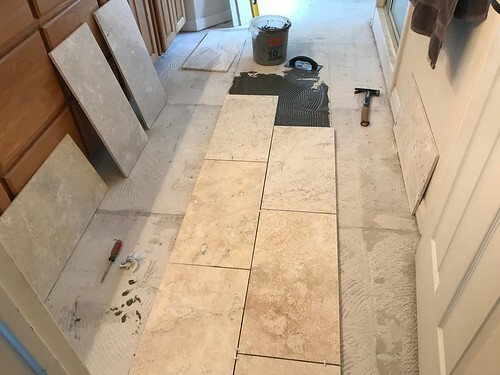 You will want very flat surfaces so the tile laying does not give you a problem. Wall tires aren't too bad, but you need to let it cure and then you need to seal the grout before it is used for best results. Thin set adhesive is the way to go these days... At least she didn't ask for the man made quartz or cultured marble walls, very $$$. If you are a carpenter, you have the skills to cut and lay tile. I've done my kitchen, office/den and garage and will soon start my master bath. If you don't have a concrete foundation to lay tile on, you'll need to install cement board, don't lay tile on sheetrock! I have a wet saw to cut tile which makes it very easy but it's not absolutely necessary, a manual tile cutter will work as well. Home Depot rents tile saws. Plus a lot of tile/flooring stores may also have them to rent. Steveo is right about the cement board too. Just use thin set mortar and not mastic/bubble gum. I have been looking at tile cutting saws and rentals. Have decided to buy one as I figure renting for a couple of weeks will equal the cost of a new saw. Plus after that I can give it to my brother to use in his garage project. I will probably take it down and redo it after I finish the bathroom as an inspector said the tile wall was not far enough away from the walls. it is 1.5 inches and should be 2+ inches from the wall. I just demo'd the floor tile in my master bath yesterday, plan to start laying new tile next Sat. i agree with all of the above,, lay out the tile dry before the thin set . go slow . 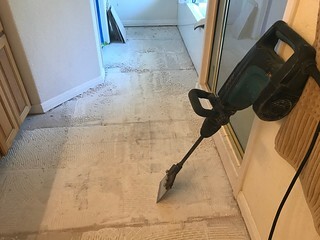 Alternative to the quick way SteveO did is to use a hammer and stiff blade putty knife to knock the mortar off the concrete floor or cement board. 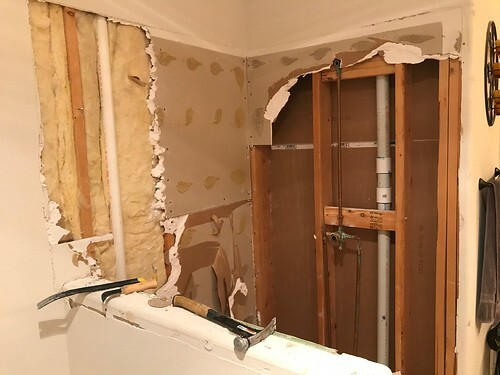 Cement board is the proper way to do it but the green paper drywall is passable if you are doing a patch of repair of an existing wall that was old school before they used concrete board on tile walls, years and years and years ago. Preferred you take the wall of tile off and replace but if you are patching using existing tile then it is time to replace it. Some home owners don't have the money to do it or hire it out. Or time to replace it as it is a long weekend of work to redo it if you are fast and just demo the wall and start over and don't waste time. Then you have 3-4 days for it to cure...so baths are not by shower but by sink or tub if you don't splash the walls. Sealing the grout is a must do after it cures...and regular maintenance.